I’ve always been interested in jewellery, especially costume jewellery and it’s something I sport every day. It could be something large or small on my wrist or on my ears. I’ve also been making my own jewellery for some time now; usually from bits and bobs I already own or upcycling an old piece of jewellery. The prospect of creating something completely new with the same set of materials amazes me. So, when I heard about a bracelet making workshop in Toronto, I immediately signed up. The workshop was hosted by Melissa De Luca, the owner and creator of Fredrick Prince Artisan Jewellery. Apart from being a lover of 90s hip hop music, she’s a fearless risk-taker dabbling in buying, logistics, marketing, product, packaging and design of her brand. It was her first workshop so no limitations were set for how long we could take to make our layered bracelet or what beads, gemstones or chains we could use. She left us completely to our imagination and creativity. I felt like a kid in a candy store. The process of creation can be daunting. What seems practical in your head doesn’t always look perfect when laid out. A tip – it’s usually better to have a symmetrical design and keep a point of focus, possibly a larger stone in the middle and branching out. However, with so many colours, sizes and finishes of beads safe to say my friend and I were struggling. There are no rules it’s simply a case of trial and error, so have fun! By trying out different beaded sequences on a beading mat and picking Melissa’s brain about different elements, styles and crafting practices, we managed to create something. I assembled a grey/bronze themed beaded line which included two marble effect white beads, pyrite and grey agate beads. Tiny connecting beads in bronze and gold were added to catch the sunlight when worn. After this point, Melissa helped us lay down some chain options. The beauty of this particular design was that I could go for a silver, gold or bronze finish chain – which was the Fredrick Prince style. I was drawn towards lapis lazuli beads, which coincidently is a symbol to inspire patience and wisdom. I paired them with white glass beads – seemed easy enough, blue and white. When placed together the white was too stark. To maintain the sharpness of the blue, I removed the white beads and added bronze findings in different shapes and finally ended up with something I was proud of. 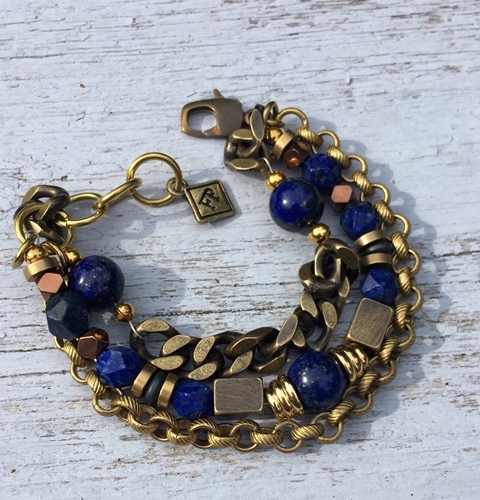 I went one step ahead to make the design come together by adding a beaded cluster to the antique brass chain layer of the bracelet. For a chunkier look I added another brass chain layer of smaller width to offset the design. Once assembled with clasps and beaded through wire. I tried on the bracelet for size and it was perfect! The feeling of going home with a one-of-a-kind bracelet created by myself was truly special and will make me treasure it. Learning some tips and tricks to help me when I make my own jewellery was a bonus. Since I enjoyed the workshop so much, I partnered with Melissa for my birthday giveaway. If there’s a jewellery making workshop in Toronto you think I should go for, lemme know! What a beautiful setting! Sounds like a great workshop. Exactly! The space is super relaxing and Melissa is an awesome host and teacher. She also has pendant and layered necklace workshops. It most definitely was Trice! Wow that was really cool. Thanks for the behind-the-scenes. “The process of creation can be daunting. What seems practical in your head doesn’t always look perfect when laid out.” – You can’t say that again. That applies even in personal life. This looks so fun! And the jewelry turned out fabulous! Yes, it took a while but I was SO happy with the final design. What great idea! They all look so pretty! how fun! I love jewelry. It really was, Jillian. Keep following for more exciting baubles!